With his work often taking inspiration from the bridges in Singapore, photographer and Chinese poet Lee Leng Kiong (李宁强) elevates the humble linkway to an emotional landmark, acting as a backdrop for all human tragedies, celebrations and life itself. And when Ding Yi Music Company Principal Guest Conductor Quek Ling Kiong (郭勇德) met Mr Lee in a chance encounter, something clicked, and the theme for Ding Yi Music Company’s year-end concert was born. Taking place at the Esplanade Recital Studio on December 2 (Sun), Of Music and Photography: Bridge 《乐。影：桥》 is the latest edition of Ding Yi’s Of Music Series (《乐。》系列), which aims to present Chinese chamber music in a more intriguing and immersive manner, showcasing multi-disciplinary art forms to help audiences better appreciate both music and art. While previous editions have seen collaborations involving sand art, dance and even pottery, this year’s edition turns the lens towards photography, specifically, photography of iconic bridges in Singapore. During the one-hour concert conducted by Quek Ling Kiong, Ding Yi will perform a series of brand-new works created by six professional composers, each inspired by breathtaking photographs of bridges taken by veteran photographers Lui Hock Seng (雷福胜), Andrew Bi Qiang (毕强) and of course, Lee Leng Kiong. The bridges featured include Anderson Bridge, Changi Jetty, the Helix Bridge, the Causeway linking Singapore and Malaysia and even everyday overhead bridges, and will serve as visual backdrops to each tune during the performance. For the composers, the bridges chosen go far beyond their practical use as walkways between two points, using them as centrepieces that have come to act as places of refuge, landmarks or symbols of new beginnings. 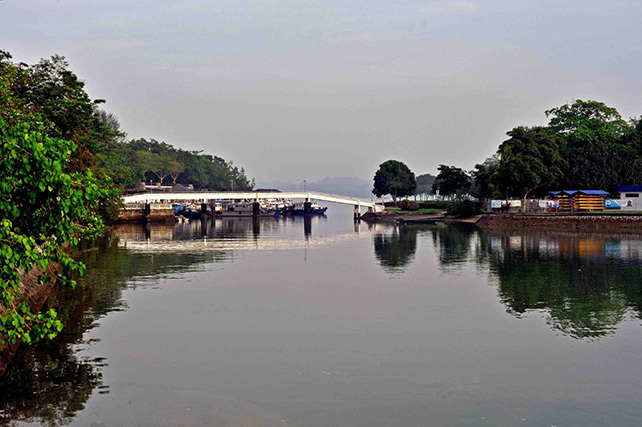 Composer Yuan Peiying (袁沛莹), for example, uses Changi Jetty bridge to create a piece themed around filial love, while Malaysian composers Chong Kee Yong (钟启荣) and Simon Kong (江赐良) found inspiration in the Causeway overhead bridges linking Malaysia to Singapore. Meanwhile, both the past and the future are explored by composers Chen Zhangyi (陈长毅) and Syafiqah ‘Adha Mohamed Sallehin respectively, with the former taking his inspiration from the historic Anderson Bridge, and the latter from the modern Helix Bridge.